Mike Todd at the Jones Beach Theater on Long Island, 1952. 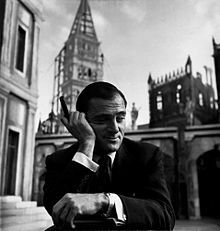 Michael Todd (June 22, 1909 – March 22, 1958), byname Mike Todd, was an American theatre and movie producer. He is known for making movies, starting the movie formats of Cinerama and Todd-AO, and his 1957 marriage to actress Elizabeth Taylor (1930-2011). Todd's 1956 production of Around the World in Eighty Days won an Academy Award for Best Picture. Todd is also well known as the third of Elizabeth Taylor's seven husbands. Todd was born Avrom Hirsch Goldbogen in Minneapolis, Minnesota, to Chaim Goldbogen (an Orthodox rabbi) and Sophia Hellerman, both Polish Jewish immigrants. He was one of nine children in a poor family, the youngest son, and his siblings nicknamed him "Toat" to mimic his difficulty saying the word "coat". It was from this nickname that his name "Todd" was derived (said in Germanic/Yiddish as "Tote"). The family later moved to Chicago, arriving on the day World War I ended. Todd was expelled in the sixth grade for running a game of craps inside the school. In high school, he produced the school play, The Mikado, which was considered a hit. He eventually dropped out of high school and worked at a variety of jobs, including shoe salesman and store window decorator. One of his first jobs was as a soda jerk at a drugstore. When that drugstore went out of business, Todd had learned enough medical knowledge from his work there to be hired at Chicago's Michael Reese Hospital, as a type of "security guard" to stop visitors from bringing in food that was not on each patient's diet. At age 17, Todd married Bertha Freshman in Crown Point, Indiana, on Valentine's Day 1927. He had been serious about Bertha since age 14, but needed to develop confidence before even asking her out. In 1929, she bore him a son, Michael Todd, Jr. A turning point came for Todd when his father died in 1931; Avrom Goldbogen made the decision to change his name to "Michael Todd" on the same day. Bertha Todd died of a pneumothorax (collapsed lung) in 1946 in Santa Monica, California, while undergoing surgery at St. John's Hospital, for a damaged tendon in her finger. Todd and his wife were separated at the time of her death; less than a week before, he had filed for divorce. The following year, Todd married actress Joan Blondell on July 5, 1947. They were divorced on June 8, 1950, after she alleged that he had abused and extorted her. Todd's third marriage was to the actress Elizabeth Taylor, with whom he had a tempestuous relationship. The couple exchanged vows on February 2, 1957. Todd was 47 and Taylor was 24; he was her third husband. Todd and Taylor had a daughter, Elizabeth Frances (Liza) Todd, who was born on August 7, 1957. On 22 March 1958, Todd's private plane Lucky Liz crashed near Grants, New Mexico. The plane, a twin-engine Lockheed Lodestar, suffered an engine failure while being flown overloaded in icing conditions. The plane was flying at an altitude which was too high to sustain flight with only one working engine under those conditions. The plane went out of control and crashed, killing all 4 people on board. In addition to Todd, those who died in the crash were screenwriter and author Art Cohn, who was writing Todd's biography The Nine Lives of Mike Todd; pilot Bill Verner; and co-pilot Tom Barclay. Taylor wanted to fly to New York with her husband, but stayed home with a cold after her pleas to come along were overruled by Todd. Just hours before the crash, Todd described the plane as safe as he phoned friends, including Joseph Mankiewicz and Kirk Douglas, in an attempt to recruit a gin rummy player for the flight: "Ah, c'mon," he said. "It's a good, safe plane. I wouldn't let it crash. I'm taking along a picture of Elizabeth, and I wouldn't let anything happen to her." There was a closed coffin, but I knew it was more for show than anything else. The plane had exploded on impact and whatever remains were found could not be identified... The only items recovered from the wreckage were Mike's wedding ring and a pair of platinum cuff links I'd given him. The remains were desecrated by thieves, who broke into Todd's coffin looking for a $100,000 diamond ring, which, according to rumor, Taylor had placed on her husband's finger prior to his burial. The bag containing Todd's remains was found under a tree near his burial plot; the bag and coffin had been sealed in Albuquerque after Todd's remains were identified following the 1958 crash. Todd's remains were once more identified through dental records and were reburied in a secret location. Todd began his career in the construction business, where he made a fortune but later lost it. He opened the so-called College of Bricklaying of America, buying the materials to teach bricklaying on credit. The school was forced to shut its doors when the Bricklayers' Union did not view the college as an accepted place of study. Todd and his brother, Frank, next opened their own construction company. Their company was worth over a million dollars but came to an abrupt halt when its financial backing failed in the wake of the Great Depression. Not yet twenty-one, Todd had lost over a million dollars with the loss of his backer. He was now the father of an infant son and had no home for his family. He later served as a contractor to Hollywood studios, and during the 1933-1934 Century of Progress Exposition in Chicago, he produced an attraction called the "Flame Dance." In this number, gas jets were designed to burn part of a dancer's costume off, leaving her naked in appearance. The act attracted enough attention to bring an offer from the Casino de Paris club in New York City. Todd got his first taste of Broadway life with that engagement and was determined to find a way to work there. He came up with the idea of producing the Gilbert and Sullivan operetta The Mikado with an all-African-American cast. The Hot Mikado, starring Bill "Bojangles" Robinson, opened on Broadway March 23, 1939. His Broadway success gave him the nerve to try taking on showman Billy Rose. Todd visited Grover Whalen, president of the 1939 New York World's Fair, with a proposal to bring the Broadway show to the World's Fair. Whelan, eager to have the show at the fair, covered Todd's Broadway early closing costs. Rose, who had an exclusivity clause in his fair contract, met Todd at Lindy's, where Rose learned his contract covered new forms of entertainment only. Todd's Mikado dated back to 1885. To avoid any head-to head competition, Rose quickly agreed to promote Todd's production along with his own. Todd went on to produce 30 Broadway shows during his career. Todd's business career was volatile, and failed ventures left him bankrupt many times. In 1945, Todd suggested the idea of holding the Major League Baseball All-Star Game in newly-liberated Berlin (Germany). Although baseball's new commissioner Happy Chandler was reportedly "intrigued" by the idea, it was ultimately dismissed as impractical. The game was finally cancelled due to wartime travel restrictions. In 1952, Todd made a production of the Johann Strauss II operetta, A Night In Venice, complete with floating gondolas at the then-newly constructed Jones Beach Theatre in Long Island, New York. It ran for two seasons. In 1950, Mike Todd formed The Cinerama Company with the broadcaster Lowell Thomas (who founded Capital Cities Communications) and the inventor Fred Waller. The company was created to exploit Cinerama, a movie process created by Waller that used three movie projectors to create a giant composite image on a curved screen. The first Cinerama feature, This is Cinerama, was released in September 1952. Before its release, Todd left the Cinerama Company to develop a widescreen process which would eliminate some of Cinerama's flaws. The result was the Todd-AO process, designed by the American Optical Company. The process was first used commercially for the successful 1955 movie adaptation of Oklahoma! (starring Gordon MacRae and Shirley Jones). Todd later produced the movie for which he is best remembered, Michael Todd's Around the World in 80 Days, which debuted in cinemas on October 17, 1956. Costing $6 million to produce, the movie earned $16 million at the box office. In 1957, Around the World in 80 Days won the Best Picture Academy Award. A William Woolfolk novel from the early 1960s, entitled My Name Is Morgan, was considered to be loosely based on Todd's life and career. ↑ p. 24, Cohn, Art, The Nine Lives of Mike Todd, Hutchinson of London: 1959. ↑ 2.0 2.1 2.2 2.3 2.4 2.5 Cohn, Art (9 November 1958). "The Nine Lives of Mike Todd: A Hustler, He Never Looked Back". The Miami News. Retrieved 25 March 2011. ↑ 3.0 3.1 DeAngelis, Gina, ed. (2003). Motion Pictures: Making Cinema Magic. Oliver Press. ISBN 1881508781. Retrieved 25 March 2011. ↑ 5.0 5.1 5.2 5.3 Cohn, Art (10 November 1958). "The Nine Lives of Mike Todd: Flame Girl's His Key to Broadway". The Miami News. Retrieved 25 March 2011. ↑ "Cut Finger Proves Fatal". Pittsburgh Press. 13 August 1946. Retrieved 12 June 2010. ↑ 7.0 7.1 "Lung Blamed for Death of Producer's Wife". Pittsburgh Press. 22 August 1946. Retrieved 24 March 2011. ↑ "Sues For Divorce". Spokane Daily Chronicle. 8 August 1946. Retrieved 25 March 2011. ↑ "Milestones-August 19, 1957". Time. 19 August 1957. Retrieved 25 March 2011. ↑ "Mike Todd is Victim of Plane Crash". The Dispatch. 22 March 1958. Retrieved 12 June 2010. ↑ "3 Refused Ride in Todd Plane". Sarasota Herald-Tribune. 23 March 1958. Retrieved 12 June 2010. ↑ 13.0 13.1 "Todd Grave is Robbed in Illinois". Schenectady Gazette. 28 June 1977. Retrieved 12 June 2010. ↑ "Elizabeth Taylor Leaves for Chicago for Todd Funeral". Quebec Chronicle-Telegram. 24 March 1958. Retrieved 12 June 2010. ↑ Matt Hucke. "Gravesite-Mike Todd". Matt Hucke. Retrieved 12 June 2010. ↑ Matt Hucke. "Jewish Waldheim cemeteries". Retrieved 12 June 2010. ↑ 18.0 18.1 "Mike Todd reburial in an undisclosed location". Ellensburg Daily Record. 30 June 1977. Retrieved 12 June 2010. ↑ "Bag of Bones Identified as Todd's". Sarasota Herald-Tribune. 30 June 1977. Retrieved 12 June 2010. ↑ Los Angeles Times, June 29, 1977. ↑ "Todd's body stolen:By sick person or extortionist?". Modesto Bee. 25 June 1977. Retrieved 12 June 2010. ↑ "Photo of Muriel Page in Flame Dance". Century of Progress. 1933. Retrieved 25 March 2011. ↑ "The Theatre: New Play in Manhattan: Apr. 3, 1939". Time. 3 April 1939. Retrieved 25 March 2011. ↑ Cohn, Art (19 November 1958). "The Nine Lives of Mike Todd: His Name in Lights". Beaver Valley Times. Retrieved 25 March 2011. ↑ Cohn, Art (12 November 1958). "The Nine Lives of Mike Todd: Meets Billy Rose Head On". The Miami News. Retrieved 25 March 2011. ↑ Frumkes, Roy (1995). "Mike Todd, Jr. Interview". Classic Images. Retrieved 12 July 2010. ↑ Michael Todd Agrees to Bankruptcy Move. Billboard. 4 October 1947. Retrieved 2011-03-25. ↑ "Cinema: The Third Dimension". Time. 2 July 1951. Retrieved 25 March 2011. ↑ Hecht, Jeff (October 1996). "The Amazing Optical Adventures of Todd-AO". Optics & Photonics News. Retrieved 12 July 2010. ↑ "The Theater: New Musical in Manhattan November 22, 1948". Time. 22 November 1948. Retrieved 25 March 2011. Cohn, Art. The Nine Lives of Mike Todd. Hutchinson of London, 1959. Wikimedia Commons has media related to Michael Todd.